Only thing I would worry about is the material shrinking as it cures and how much heat it may generate as it cures. It looks like a fairly small mass, but you won't know unless you try! I ordered a Quart sampler and will check it out. Take a look at Smooth-On's Encapso K.
It can be poured thick and the bubbles generally work themselves out just fine with no pressure chamber. 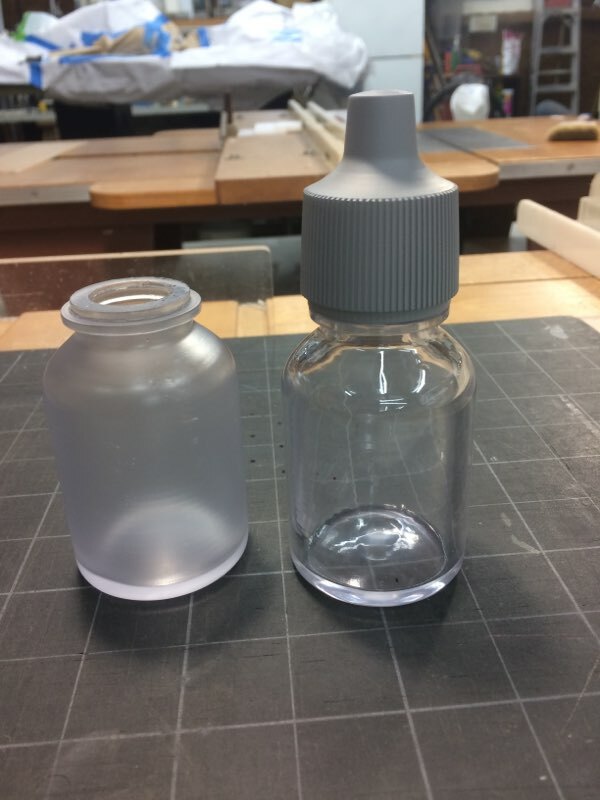 I'm trying to fill an SLA printed bottle ( bottle on right in pic) with a material that when cured (hard), will resemble clear liquid. I tried an epoxy but the viscosity didn't let the tiny bubbles float to the top and escape. I've let excess 2-part urethane cure in a glass jar and it had large cracks when cured. Should I go for a casting urethane? Will the viscosity be thin enough for bubbles to escape? I have no pressure chamber. The bottle has been urethaned on the inside and outside surface. I could print the liquid area as a solid in the future but wanted to explore this option to save printing costs, as my client may order quantities.